When it comes to peering ahead into the autonomous vehicle future, some crystal balls are better than others. 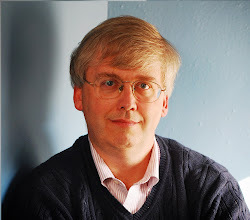 I recommend the recent report written for a group called SAFE by Charles Carson, Erica Groshen, Susan Helper, John Paul MacDuffie, W. David Montgomery, and Richard Mudge, America’s Workforce and the Self-Driving Future Realizing Productivity Gains and Spurring Economic Growth (June 2018). The main report is here, while three background papers behind the main report are available here. Here's a list of social gains, with the big ones clearly being accident reduction and consumer time. But the most intriguing and controversial issues around autonomous vehicles are not about the possibility of gains, but rather involve involve likely shifts in jobs, patterns of living and commuting, vehicle ownership (or not), and even cityscapes. By their nature, such patterns are hard to foresee. The report offers some discussion of the Interstate Highway System, where building started in the 1950s, as an example of a broad social investment with high and not wholly predictable results. "For example, investments in the construction of the Interstate Highway System have returned more than $6 in economic productivity for each $1 invested, by cutting journey times for both goods and labor. ... [T]he Interstate Highway System defied linear economic thinking, as these technologies provided significant benefits far beyond their originally-designed impact that conventional analysis failed to capture. Traditional economic studies for the interstate network showed that only 33 percent of the mileage could be justified based on traffic in 1956 and claimed that at most one road over the Rocky Mountains made economic sense. Eventually, growing demand led to three highways being built. It is remarkable that, despite an average rate of return on public investment of between 50 and 60 percent, economic benefits did not even rank in the top three factors cited by supporters for the highway network’s construction when the enabling legislation was passed in 1956. "In retrospect, the Interstate Highway System constantly outperformed expectations and had a clear and dramatic positive impact on the U.S. economy. However, the forecasts of the network’s impacts significantly under-estimated demand. By 1965, the number of vehicles traveling on the network and the vehicle miles traveled (VMT) served were 11 and 9 percent higher than estimated, respectively. The Interstate Highway System also contributed to a Gross Domestic Product (GDP) that significantly performed above forecasts for that period. In addition, ... the rate of return for investment (ROI) in the Interstate Highway System far exceeds returns on other broad investment classes from 1950 to 1990." 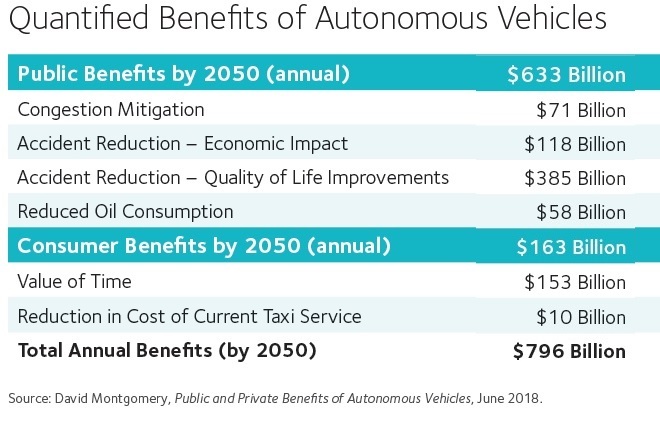 It seems plausible that the range of benefits and effects from autonomous vehicles could be equally eclectic. For example, posit that AVs make travelling easier (less congestion, greater flexibility, and the ability to do something else while riding). It seems plausible that people could more easily go a little further to reach jobs, which means that low-income people in parts of a metropolitan area without many nearby jobs might find it easier to reach jobs elsewhere in the metro area. 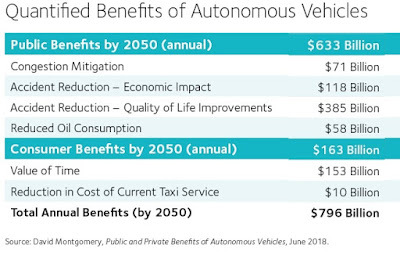 For example, the report mentions mobility benefits: "Those previously unable to drive themselves due to a disability, an inability to afford a car, or other mobility issues would also benefit from AVs. Approximately 9 million Americans have a medical condition that affects their mobility, and of these about 8 million have reduced their daily travel. Almost 15 million people have a medical condition that affects their ability to drive, with 11.7 million people reducing their daily travel as a result. This lack of mobility leads to social isolation, reduced economic opportunities, and an inability to participate fully in community life." gains in the process. Existing studies have shown that a 10 percent improvement in access to labor increases productivity and regional output by 2.4 percent." If there was an ability for people to be delivered downtown to shop or work, with a low-cost and flexible method that delivered you where you want to go without didn't needing to drive or park, that would be a dramatic change. Imagine further that after these autonomous vehicles have dropped you off, they don't need to park nearby. They could go off to a spot outside the main downtown where they could recharge their electrical batteries. Thus, cities could substantially reduce space now devoted to curbside and ramp parking. Firms will add jobs directly associated with AVs, such as fleet service technicians or transportation aides for people with disabilities, as AVs are adopted. AV adoption will increase the need for jobs in companies that support AVs, such as parts suppliers or software engineers. Falling product and service costs resulting from AV adoption will free up discretionary income in the broader economy. New consumer demand will attract investment and lead to the growth of entirely new businesses otherwise unrelated to AVs." In my mind, the primary social discussion around autonomous vehicles should be about what is needed to facilitate their arrival. What's the Value of a QALY?